One in three Canadian teens experience some form of dating abuse, yet two-thirds never tell anyone. Sometimes they don’t know who to tell or how to talk about it, and sometimes they simply don’t recognize the behavior as abusive. It might be hard to figure out whether you’re in an abusive relationship or not – but the quick quiz below can help you figure out if you might be in a dangerous relationship. Blame you for the hurtful things he does and says? Threaten to hurt or kill you or himself if you leave him? Hit, slap, push or kick you? Ask for your email or Facebook passwords? Ask you to lose touch with your guy friends since you started dating him? Criticize some of your friends and prevents you from hanging out with certain people? Not want you to go out if he’s not there? Say disrespectful things about other girls or his exes, like calling them names? Make scenes in public, or gets into fights with you in front of your friends or at school? Show up unexpectedly at your school, at your house, at your work to check up on you? Show intensity in his ways of showing affection, of showing anger? Intimidate you by not letting you leave the room, by standing in your way? If you said yes to even one, you might be in an abusive relationship. A healthy relationship is based on mutual respect, on trusting each other, on being able to communicate freely, openly and honestly. It’s when the needs and the rights of both partners in the relationship are equal. 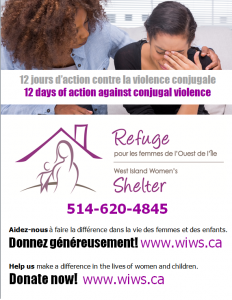 If these examples seem too familiar to you, the West Island Women’s Shelter is here to help. Please don’t hesitate to contact our 24/7 crisis line, at 514-620-4845 ext.221. A counselor is always available to answer your questions and concerns.